Aviation Updates Philippines - Dubai-based Emirates is planning to launch a triangular route from Dubai to Cebu, from Cebu to Clark and from Clark back to Dubai on March 30, 2016. CLARK COMEBACK. Emirates will be flying from Dubai-Cebu-Clark-Dubai using its Boeing 777-300ER aircraft. Photo by Miguel Cenon - PPSG. 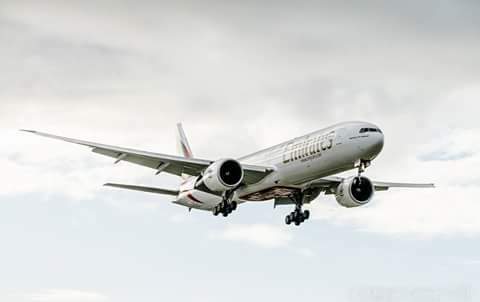 According to AirlineRoute.com, Emirates will be flying the triangular Dubai-Cebu-Clark-Dubai route on a daily basis using a Boeing 777-300ER aircraft fitted with business class and economy class seats. Emirates flight EK338 departs Dubai at 2:55 AM and arrives Cebu at 3:50 PM. The second leg departs Cebu at 5:25 PM and arrives in Clark at 6:45 PM. The third leg departs Clark at 8:20 PM and arrives back in Dubai at 1:25 AM the next day. The flight operates daily. Emirates recently operated flights between Dubai and Clark using a Boeing 777-200LR aircraft. The service began on October 2013 but ended on May 1, 2014 just seven months after the route was launched. In 2014, the Centre for Aviation reported an overcapacity on the Dubai-Philippines market with the entrance of Philippine Airlines and Cebu Pacific into the market. Emirates was serving three daily flights to Manila from Dubai while it added a fourth one in Clark. Emirates survived the Philippine market due to its large connections from its Dubai hub. The airline giant operates 245 aircraft (including 71 Airbus A380-800) all flying to 164 destinations worldwide. Gulf carrier, Qatar Airways once operated flights between Doha and Cebu using an Airbus A330 aircraft. The airline operated thrice weekly flights since December 11, 2003 but ended on March 26, 2012. The cancellation of flights to Cebu was mainly due to "rising fuel costs and high operating expenses," a Manila Bulletin report stated. Qatar Airways Chief Executive Officer Akbar Al Baker said in 2012 report that "Doha-Cebu has been one of our high demand services since we started the route in December 2003." "But following a thorough review over the past 12 months of the thrice-weekly services we have decided to suspend the Cebu flights for commercial reasons until further notice," Qatar Airways CEO said. Emirates is an airline based in Dubai, United Arab Emirates. The airline is a subsidiary of The Emirates Group, which is wholly owned by the government of Dubai's Investment Corporation of Dubai. It is the largest airline in the Middle East, operating over 3,300 flights per week from its hub at Dubai International Airport, to more than 148 cities in 78 countries across six continents. Cargo activities are undertaken by Emirates SkyCargo.